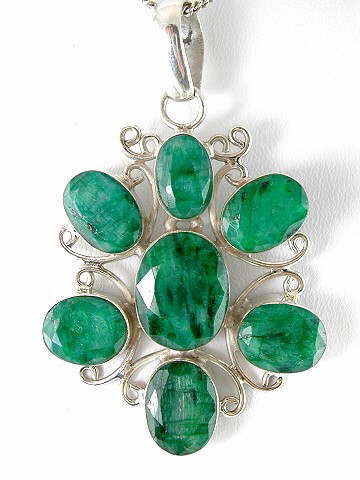 Super Emerald pendant set in a 925 sterling silver scrollwork design, on a sterling silver chain. Set with seven genuine oval faceted Emerald stones, these are what are referred to as 'massive' Emeralds; ones which are not crystalline and are, therefore, opaque. Another example of a common 'massive' stone is Rose Quartz, where the majority sold are 'massive'; with actual crystals being rarer and far more expensive. This is a lovely piece, with beautiful colour and energy. The green is so vibrant and there are a few dark flashes of matrix or the 'mother stone' included. Emerald is a stone of inspiration and creativity and it is also known as the Stone of Successful Love; bringing harmony, loyality and domestic bliss. The keywords with Emerald are unconditional love, partnership and loyality. Folklore says that if your own an Emerald and it changes colour it is a sign of unfaithfulness and another tradition linked to this glorious green stone is that it is said to protect the wearer from enchantment! Emerald works directly on both the Heart and Higher Heart chakras, opening and soothing this energy centre. It also works well on the mind and is said to assist communication. It eliminates negative states, enhances psychic abilities and aids mental clarity.